Most evangelical, including myself, believe that the Bible is true, contains truth, and is truthful. However, is it the source of truth, the ultimate truth to which Jesus came to testify? When Jesus said to Pilate, “I was born and came into the world to testify to the truth” he could not possibly have had the Bible in mind. At that time only the 39 scrolls of the Old Testament existed – the books of the New Testament had not yet been written, let alone collated into what we know as the Holy Bible. So what then was this ‘truth’ that Jesus had in mind? 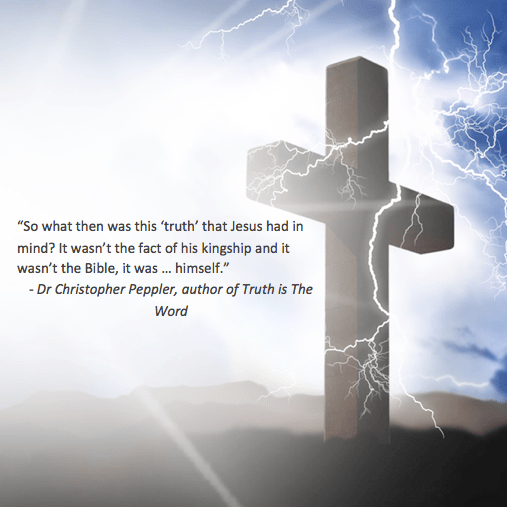 It wasn’t the fact of his kingship and it wasn’t the Bible, it was … himself. So, in the trial before the Roman governor Jesus, the very source of truth, stood before Pilate and judged him. “What is truth?” asked Pilate; “I am the truth” was Jesus’ implied response. In my next and final post in this series, I will deal briefly with the practical implications of all this. It’s amazing how simple this message really is. I recently read an article by a self proclaimed “evangelist against the evils of theism”. He used some of the most convoluted arguments to demonstrate how perverse it is to even contemplate belief in something that can’t be seen. What was more interesting (and to an extent, disturbing) was the counter argument by a Christian apologist. It was just as convoluted and complex as he attempted to address the flaws in the original proposal. I suppose that presenting this simple message of Jesus is truth is too simple for some, but for me it works. Thank you for making it easier to try and grasp this complex and profound mystery.